There was a time, believe it or not, when being the lead guitarist in a blues band didn’t mean five-minute solos with 20 notes per second. It meant three-minute songs, laying down a groove and maybe a soulful riff or two, all in service of the singer and the song. 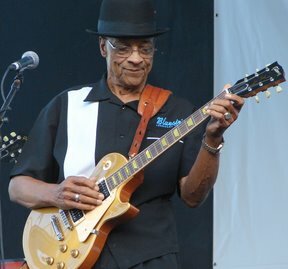 And Hubert Sumlin, the backing guitarist for Howlin’ Wolf for 20-plus years, was about the best there was. “Smokestack Lightning,” “Killing Floor” and “The Red Rooster” all benefited from Sumlin’s sparse yet spot-on fingerpicking style. Like most blues greats, however, he only achieved renown later in life, being named No. 43 on Rolling Stone’s “100 Greatest Guitarists of All Time” and consistently being invited to Eric Clapton’s Crossroads Guitar Festival in Chicago. Sumlin was 80 years old. Click here for a 1994 Guitar World interview in which Sumlin discusses playing alongside Clapton and getting his teeth knocked out by Wolf.